Scaffold Accident Attorney | Construction Injury Lawyer | Free Consultation Wittenstein & Wittenstein, ESQS., P.C. If you’ve been injured in a scaffold accident, you need an attorney that can pursue multiple causes of action to obtain the highest amount of compensation possible for your injuries. Injuries from scaffolding accidents can be catastrophic, and the money damages you collect can go a long way towards helping you get your life back on track. You need a law firm with many years of experience handling personal injury cases for construction workers for construction workers injured in scaffolding accidents to obtain this result. There are over 340 miles of scaffolding installed in New York City at any given time, it’s no wonder that scaffolding accidents happen so frequently. Most of these accidents are preventable, caused by the negligence of construction companies, their contractors and sub-contractors. Construction companies are increasingly cutting corners, providing less training, using lower quality materials and the City is not fighting back with enforcing regulations. As a result, thousands of construction workers and bystanders are injured or killed in scaffolding accidents every year. Injured construction workers can collect workers compensation, and can sue their employers if they meet certain exceptions. They are also claims against third parties and manufacturers that can be brought for construction workers injured on the job. 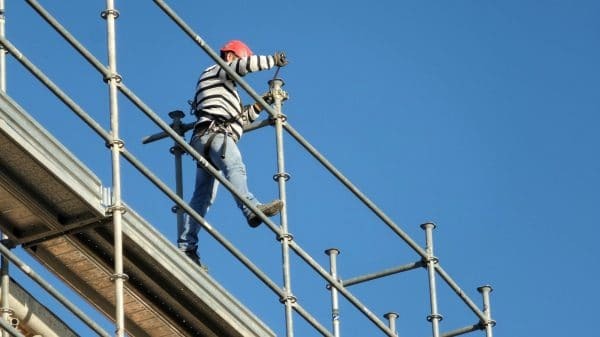 If your injury involved “falling from a height” due to a failure of a safety device such as scaffolding, there are additional claims that can be brought under Labor Law 240, known as the Scaffold Law. Claims can also be brought when a worker is injured by a falling object. A scaffold is a temporary structure used by construction workers to provide access to an area where work is being done. They are commonly used with the intention of providing a stable platform for work done above ground level. A scaffold is either suspended from a part of the building or built from the ground. Sadly, people are injured in scaffolding accidents due to failures in the structures themselves. Most of the injuries are sustained by construction workers, but sometimes a bystander or pedestrian is the victim. WHAT IS A SIDEWALK SHED? Sidewalk sheds are set up to protect to protect pedestrians from falling equipment or debris. Sometimes they are called “sidewalk bridges.” The Department of Buildings regulates these structures, and mandates the height, lighting requirements, materials that can be used, and everything else about these structures down the minutia. Despite this strict regulation, workers and pedestrians are sometimes injured in construction accidents when sidewalk sheds collapse. Last example, in November, 2017, a young model was severely injured when a sidewalk shed collapsed. At the time of this tragedy, there were around 7,000 sidewalk sheds erected in New York City, now there are close to 9,000. Other recent scaffolding accidents produced damages to cars on the street and a man was injured by bricks falling from a defective sidewalk shed. The City is allowing builders to inspect their own sheds, when there should be oversite from somebody other than the builder, who has an incentive to save money by not building the sheds up to Code. Sometimes the sheds stay up for over ten years because builders don’t make the necessary repairs which will permit them to be taken down, causing the aging shed themselves to become a danger. Suspension scaffolds must be secured with hardware and ropes that can hold six times their maximum loads. A scaffolds height must be more than four times the size of its base. Legs, posts, frames, and brackets must be used to support platforms. A ladder or ramps must be provided when the platform is more than two feet from an access point. Only competent trained personnel may erect, dismantle, move or alter a scaffold on construction sites. A competent person must routinely inspect scaffolding, and replace defective parts. A competent person must assess whether work on a scaffold has become unsafe due to high winds. A construction company needs a permit from the Department of Buildings to erect a scaffold. Additionally, only a “special-rigger” or “expeditor” may apply for a hanging scaffold permit. The person that applies for the permit must be present during the entire course of rigging the scaffold. All construction workers involved must have a Certificate of Fitness. A copy of the drawings approved by the Department of Buildings must be hung on site. These sound like serious safety standards, but they are not adequately enforced. With lax regulation and increasing construction, it’s no wonder that injuries to workers from scaffold accidents are also increasing. Every construction project results in injured workers, some injuries more serious than others. Injury lawyers can help obtain compensation, and also send a message to builders with unsafe sites, protecting workers from future accidents. If you’ve been injured in a scaffolding accident, please call Wittenstein & Wittenstein for a free consultation at 718-261-8114.